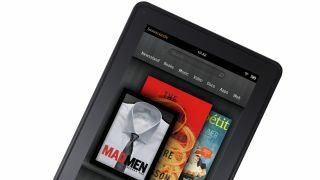 Amazon has announced that the Kindle Fire tablet is now 'sold out', adding that it has 'an exciting roadmap ahead'. Given the bragging that's going on in the announcement, we'll give you one guess what the company has up its sleeve for its September 6 event. The company claims that the first Kindle Fire managed to 'capture' 22 per cent of US tablet sales in the nine months since its launch, adding that it was "the most successful product launch in the history of Amazon.com". So it's clear that Amazon isn't retiring from the tablet game, as further evidenced by CEO Jeff Bezos' comment that "we have an exciting roadmap ahead". That leaves only one logical option: Kindle Fire 2. "We're grateful to the millions of customers who have made Kindle Fire the most successful product launch in the history of Amazon," said Jeff Bezos, Amazon founder and CEO. "This has been a big year for digital products on Amazon—all of the top 10 sellers on Amazon.com since Kindle Fire launched just less than a year ago are digital products. "Kindle Fire is sold out, but we have an exciting roadmap ahead—we will continue to offer our customers the best hardware, the best prices, the best customer service, the best cross-platform interoperability, and the best content ecosystem."